Image published by blogadmin	on August 14th, 2011	in post Athens: Panathinaiko (Kallimarmaro). The ancient remains of the old Panathinaiko Stadium were excavated and refurbished, with funds provided by Evangelis Zappas for the revival of the Olympic Games. Mr. Evangelis Zappas sponsored the Olympic Games that were held in Athens in 1870 and 1875. 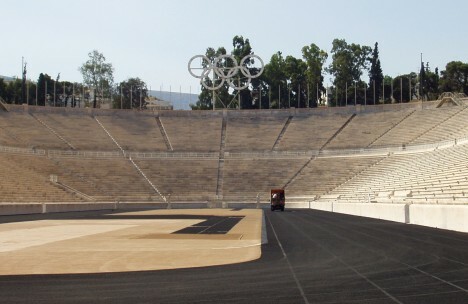 The Panathinaiko Stadium was refurbished in 1895 again for the modern 1896 Olympic Games, with funding of George Averoff. The stadium has also been used sometimes as a venue for musical performances (Depeche Mode, Tina Turner, Metallica, Black Sabbath, Sakis Rouvas and others).